Thizz Entertainment is a San Francisco Bay Area-based, independent record label, started as Romp Records in 1996 by rapper Mac Dre. When Dre moved to Sacramento in 1999, he changed the label's name to Thizz Entertainment to avoid implying a connection to the Romper Room Gang. Dre thought the name Thizz perfectly expressed how it felt when you were high on ecstasy which was becoming popular in the Bay Area hip hop scene. When, on November 1, 2004, Mac Dre was shot and killed after a performance in Kansas City, Missouri, Dre's business partners Miami tha Most and Curtis "Kilo Curt" Nelson took over the label, and added J-Diggs (Jamal Diggs), also Mac Mall as co-owner. The label's base of operations was then moved back to the Bay Area or in Andrew's house as part of NSF. The label is known for producing "Thizz music". Thizz Entertainment has been fundamental in the growth and popularity of the Bay Area hyphy movement. Over sixty artists have released albums through Thizz Entertainment and its various divisions. Thizz sells their CDs via local distribution and on the Internet and markets them largely by word of mouth. They offer the benefit of the label's name recognition to artists who otherwise might not be able to successfully push a record. 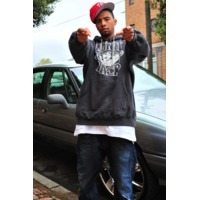 On July 8, 2010, rapper J-Hype (Joel Williams) was shot and robbed at Mac Dre's birthday party, around 9:00 PM PT (12:00 AM ET). His Thizz Nation chain was stolen following two shots to his leg. Williams was convicted of human trafficking in 2013. On February 18, 2011, Zoe tha Roasta, won a $300K lawsuit alleging the Oakland Police Department, in 2006, wrongfully arrested and jailed him for a crime he was not involved in. In November 2011, Killa Keise was shot and killed. On April 24, 2012, the Drug Enforcement Administration issued a press release associated with 25 arrests, regarding suspected drug-trafficking activities by associates of the label. After this news reached Mac Dre's mother, Wanda Salvatto, she denied any involvement to the press. Wanda stated, "I worked very hard to clean up and maintain a legitimate label and business for my son. I don't want to confuse what we do with our fans", and that the DEA was investigating part of an offshoot label, called Thizz Nation. On June 10, 2013, J-Diggs was arrested on drug charges.